Take a break from the holiday bustle with some fun, FREE (and nearly free) events in Austin! You still have several chances to take the kids to see Santa and enjoy free treats! Plus, you can wrap up your holiday shopping at a unique Austin shopping event, catch an outdoor holiday movie, enjoy a special symphony performance, geek out on anime, and more! Check out our calendar for even more FREE fun. It’s that time of year again! 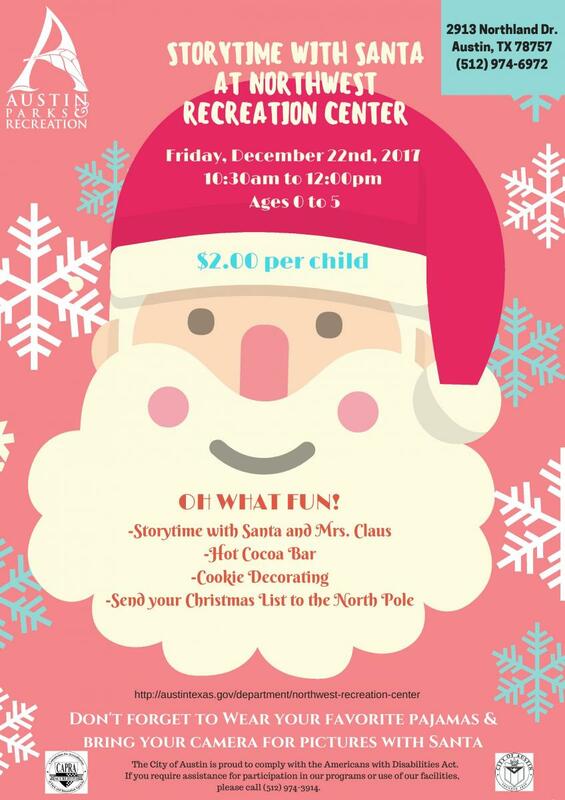 Put on your favorite holiday pajamas and come visit Santa and Mrs. Claus at the Northwest Recreation Center for a special reading of “The Polar Express”. There will be a hot cocoa bar, cookie decorating station, photos with Santa and a chance to send your Christmas list to the North Pole! Come to the Central Health Southeast Health and Wellness Center for free cookies, hot cocoa, apple cider, crafts, raffles, and photos with a bilingual (English/Spanish) Santa. For more information call 512.978.9807. FREE! Blue Genie Art Bazaar 2017 – Last Weekend! Friday-Sunday, Dec. 22-24| from 10 a.m to 10 p.m. | Blue Genie Art Bazaar, 6100 Airport Blvd. Bring the clan and head over to Ski Shores Cafe for Friday Family Movie nights! The film will start at dusk and you can have FREE s’mores by the fire! What better way to celebrate the end of your work week than an evening by the lake with loved ones, movies, food and beverages? This week: Flubber. *Note: Ski Shores will be open on days when it is above 60 degrees and dry (closed otherwise). Thousands of dazzling lights have been sculpted into giant iconic objects, custom-made in Greece, that evoke Austin’s culture and the Christmas season, including a dozen guitars, the State Capitol, and a tree filled with presents, plus, an audio-activated wall of lights. Thousands of other lights will be imaginatively strung in the trees, facades, and rooflines. All will be placed around Mozart’s lakeside deck. For refreshment, Mozart’s acclaimed coffee and hot chocolate can be purchased inside the coffee house and at kiosks outdoors. Special holiday goodies from Mozart’s bakery will also be available. High Points of the Show/Timing: The exhilarating high points of the show, super light-ups and live choral singing, will be spaced throughout the entire evening. Families can relax and arrive at any time to get their over-the-top dose of Christmas magic. Show is FREE! Come for a story time, craft, and donuts provided by Shipley Do-Nuts! The whole family is welcome! FREE! Be a part of a fun Christmas tradition! 200 tuba players performing Christmas carols on the south steps of the Texas Capitol. FREE! Stop by Barrel of Fun, where they are mashing up Anime favorites with crafts and activities from Colony Drop Cosplay and Texas Anime, and trivia with Alamo prizes and special surprises. They’ll also have some hands on activities for our younger Anime fans. It’s Austin’s moment to dress up and geek out over giant robots, fantasy, and high-speed fun. Dancing optional, COStumes welcome. This family-friendly event is FREE! The Austin Symphony is once again bringing FREE music to all Austinites this holiday season. Christmas in the Community is a series of concerts held throughout the city of Austin featuring different ensembles of the orchestra playing familiar holiday music. Grab a bag of kettle corn, bundle up, bring a blanket and enjoy holiday movies under the stars and lights in Austin’s beloved Zilker Park. Prep & Landing – 7 p.m., Elf – 8 p.m. This night’s general admission is FREE and open to the public, but you may also purchase ZIP Fast Passes or Platinum Passes for a premium Movie Night experience. Don’t forget to purchase limited nearby parking early or shuttle passes. This event was rescheduled from Dec. 19. Hot music, fine art, and cold beer make the Armadillo Christmas Bazaar the place where Austin shops in the giving season. The show is actually two events in one: an art fair and music festival with a vibrant community-driven vibe. Visitors can explore an amazing array of handmade items from 160+ artists while enjoying live local music and sips from a full bar. It all adds up to a fun authentic Austin experience. Food and drink from open to close. $8 for a single day pass; kids 12 and under are free. Check out this amazing lineup of live music this weekend, including Shelley King, Asleep at the Wheel, Nakia, the Peterson Brothers, and more! Get your tickets here. Downtown merchants will be hosting the inaugural Lost Pines Cookie Crawl, baking up the most delicious treats for jolly old Saint Nick. Sample dozens of cookies at various locations. Pictures with Santa will also be available until the cookies run out. FREE admission and family-friendly!